Final New England Patriots 53 Man Roster Projection | NFL News, as it happens, when it happens. Your one stop shop. On Tuesday, Bill Belichick had to cut his roster down to seventy-five players. The roster will need to be down to fifty-three players by the end of the week. There is probably about forty or so spots that are already locks. However, there is still about ten spots that are up in the air. Those players will be playing for their jobs on Thursday night in Foxborough against the New York Giants. So without further a due, here is my final fifty-three man roster projection for the 2015 New England Patriots. Quarterback: Tom Brady, Jimmy Garoppolo. Reports have been that Tom Brady is expected to play in the first game of the season no matter what Judge Berman’s decision is by weeks end. Therefore, the team will have no need for Ryan Lindley. He will have his chance to showcase his skills to other teams in Thursday nights game against the Giants. Running Back: Dion Lewis, Jonas Gray, Brandon Bolden, James White. 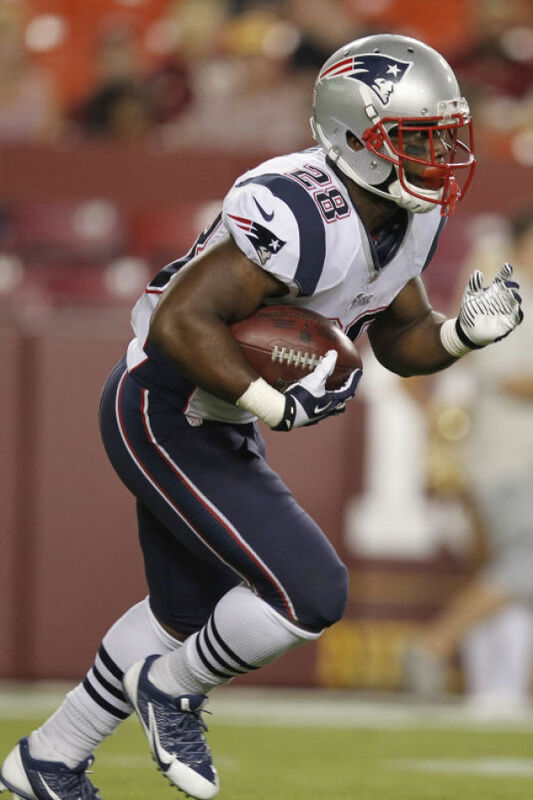 With LeGarrette Blount only suspended for one week, there is no need for an extra running back for one game. With Dion Lewis able to stay on the field, and Travaris Cadet missing the majority of the preseason, Lewis has played Cadet right out of a job. It is a shame because he looked like he had some ability and could be a good fit in the Patriots system. Wide Receiver: Julian Edelman, Danny Amendola, Brandon LaFell, Reggie Wayne, Aaron Dobson. Many Patriots fans fell in love with Chris Harper over the summer. He flashed his speed and ability to get open against second and third team players. However, when it comes down to it the Patriots did not invest much in Harper, and they spent a second round pick on Aaron Dobson. It is rare for the team to give up on a player after only two seasons, and they still have the option to put Harper on the practice squad where he will most likely land. Tight End: Rob Gronkowski, Michael Hoomanwanui, Scott Chandler, Asante Cleveland. No surprises here. With James Develin out for the season with a broken tibia that he suffered last week when he was unnecessarily in the game in the fourth quarter, an extra spot has opened for a tight end. The Patriots somehow received something for Jordan Devey, and what they got was tight end Asante Cleveland. In his two preseason games with the team, he has been decent. He is built very similarly to Tim Wright. He may posses the same skill set to get open a few times per game. of the 2015 AFC Championship Game at Gillette Stadium on January 18, 2015 in Foxboro, Massachusetts. Tackle: Nate Solder, Sebastian Vollmer, Marcus Cannon, Cameron Fleming. 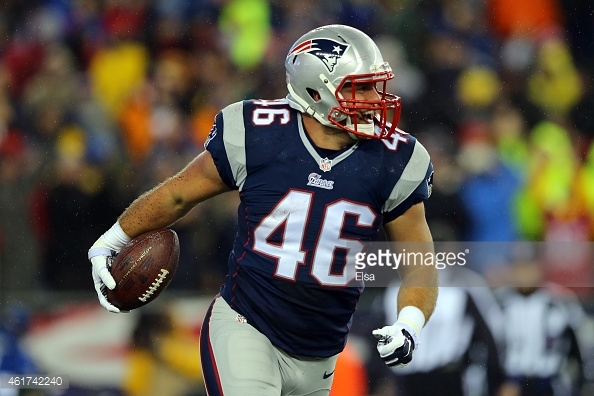 The Patriots should have two Pro-Bowl caliber tackles this season with Sebastian Vollmer and Nate Solder. Nevertheless, the team invested a fourth round pick on Fleming in 2014, and this past winter they gave Marcus Cannon extension. Also, Vollmer’s contract is very accessible for a trade. Just keep that in mind in the coming days. The Logan Mankins trade shocked many at this time last year. Guard: Ryan Wendell, Tre Jackson, Shaq Mason, Ryan Groy. Josh Kline has proven in the past that he is inconsistent and non-reliable. He is not worthy of a roster spot anymore with the two rookie additions along with Ryan Groy, who they traded sixth round pick Matthew Wells for. If the team was ever severely strapped for bodies at the guard position, Marcus Cannon has experience at the spot. Center: Bryan Stork, David Andrews. David Andrews has received almost every rep at center this summer. He has not been overly impressive, but for an un-drafted rookie that was thrown into the fire due to an injury to Bryan Stork, he has been decent. With Ryan Wendell being the only guard on the roster with any real experience starting, he will be valuable to the team and they can’t have him moving back and forth from guard to center. Defensive End: Chandler Jones, Rob Ninkovich, Jabaal Sheard, Geneo Grissom, Trey Flowers. No shockers here. 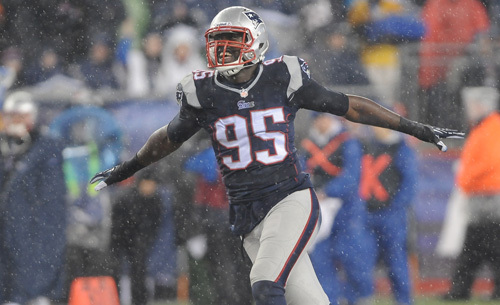 Chandler Jones has bulked up significantly this offseason and has spent some time this preseason with his hand in the turf as a 3-4 defensive end. That should be an interesting storyline to follow given the fact when Bill Belichick and Matt Patricia tried that strategy last September, it back fired greatly. Jones was pushed around all over the line of scrimmage. We shall see if his added size will contribute to him being able to penetrate more. Defensive Tackle: Sealver Siliga, Malcom Brown, Dominique Easley, Alan Branch. Chris Jones is expected to be placed on the physically unable to perform list to start the season. This means that he will be unavailable until week six. In his place, a player such as veteran Alan Branch will try to take his spot. Most of the Patriots defensive tackles are larger framed players, except for Easley who is more lean. Easley is extremely powerful and strong, and is being vastly under looked for this season. Linebacker: Jerod Mayo, Jamie Collins, Dont’a Hightower, Jonathan Freeny. In addition to Chris Jones, Dane Fletcher is also expected to be placed on the PUP list. Four linebacker should be just right for the Patriots, seeing how the defensive coaching staff may like to use players such as Rob Ninkovich, Geneo Grissom, and Jabaal Sheard as outside linebackers. Look for James Morris to land on the practice squad. Cornerback: Malcolm Butler, Tarell Brown, Robert McClain, Bradley Fletcher, Logan Ryan. On any pro team with a halfway decent cornerback depth chart, Logan Ryan would be released. However, the Patriots need bodies at the position and unfortunately Ryan has more experience in the system than any other cornerback on the roster. It is a shame because he truly is a liability when he is on defense. 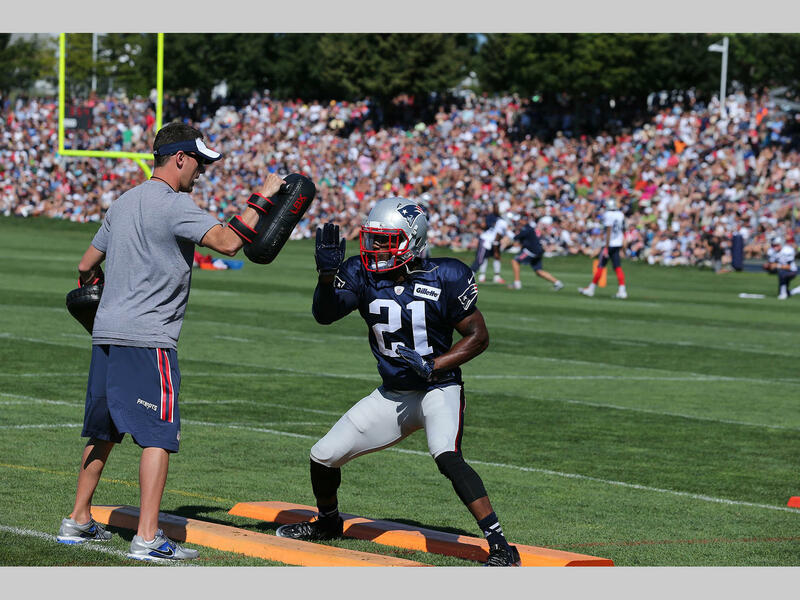 Safety: Devin McCourty, Duron Harmon, Patrick Chung, Jordan Richards, Tavon Wilson. Nate Ebner is the surprise cut here. He is a phenomenal special teams player. Although, he cannot contribute very much on defense. Tavon Wilson is almost just as good of a special teamer and he can certainly contribute more on the defensive side of the ball. Special Teams: Stephen Gostkowski, Ryan Allen, Joe Cardona, Matthew Slater. Very rarely does a team hold a spot open on special teams for a player that isn’t involved directly in the kicking game. Matthew Slater is just that good at what he does, and he may be a better team leader. In addition, Joe Cardona has not been as advertised thus far. Keep an eye out for that in the early part of the season.